Kevin has been a qualified solicitor for over 30 years practicing in Taunton and Bridgwater. He brings immense experience to the practice which has a diverse team of lawyers equipped to deal with all levels of family law enquiries. Like many of his generation, Kevin began as a general practitioner. Legal Practice has changed significantly over the years and Kevin now specialises exclusively in complicated legal proceedings concerning children. Kevin was Honorary Secretary of The Somerset Law Society between 1991 and 2007 when the Society merged with Devon and Exeter. Kevin was President of the Association of South Western Law Societies in 2001. 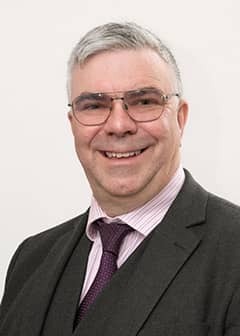 Kevin has always been a Legal Aid Lawyer and has been a member of the Law Society Children Panel since December 1994 and a member of the Law Society Family Law Panel (Advanced) since June 2002. Most of his clients are children or adult family members involved in care proceedings. Kevin is very experienced in representing adults who are learning disabled or who suffer from mental health problems. Kevin works with other professionals to achieve the best possible outcomes for his clients. This includes Childrens Guardians in respect of younger children and also the Official Solicitor and with speech and language experts for adults under a disability. Kevin set up KSFLP in 2008 following the closure of the Taunton office of a regional firm where he had been a partner. KSFLP has grown since then with the recruitment of specially selected personnel from other local firms combined with home grown talent to create the comprehensive team that is now in place. This is a family law firm where families are the focal point. Through flexible working practices, a number of key personnel have started their own families and following career breaks have returned to successfully combine childcare with work and study. The composition of the team at KSFLP has changed seamlessly over the years to provide continuity of service to clients. In 2012, KSFLP achieved the Law Society Lexcel specialist quality mark. This is a standard of practice management that sets the firm apart from many rivals in the local community. It is a badge of excellence that is challenging to achieve and which promotes a high standard of client care for all. Excellent. First class service provided – as usual. Cafcass Taunton. Very professional. Always prompt response. Very helpful. Didn’t come across as after loads of money from cases (as I’m sure many solicitors are), but only interested in sorting out clients’ needs effectively and efficiently. Thank you, Kevin. You seem to have the right balance - professional and efficient and yet still caring. I was very lucky that D recommended you. Good luck in the future. Mrs S F from Weston super Mare. First class, could not have expected any more. Thank you Kevin Miss JMT from Yeovil. Very good. Friendly and informative. Got things sorted quickly and kept me informed every step of the way. I got the result I wanted. Mr Shearn couldn’t have done any more. Miss C R from Wellington. The impression I received was he was on my side and would do the best for me. 14 year old boy in care proceedings. Excellent, professional caring service. I feel that I was well represented and offered the best advice for my individual services. Mr JG from Devon. Knowledgeable, helpful, friendly and responsive. Thanks for your help, couldn’t have done it without you. Mr and Mrs W from Taunton. Professional, knowledgeable and approachable – very impressed. All calls returned, all requests granted. Mr D from Taunton. Very good. Kept us up to speed. Would recommend to anyone. Brilliant man explained every step. Mr and Mrs D from North Petherton. Emma qualified as a solicitor in 2005 and is now an Associate with this firm. Whilst she has experience in dealing with all areas of family law, she now focuses on public and private Children Act matters. She also has a particular interest in helping to secure injunctions for victims (whether they be men or women) of domestic abuse. Until 2016, Emma sat as the Chair of the Taunton Deane Domestic Abuse Forum for four years and was vice chair before this. She remains a forum member and continues to raise awareness of domestic abuse and share information with other front line professionals - all with the aim of keeping victims safe. Emma is a member of the Law Society's Children Panel and of Resolution (formerly the Solicitors Family Law Association). She is also a Resolution Accredited Specialist in Domestic Abuse and Private Children Act matters. Very good. I was very impressed. Miss CC from a Womens Refuge. I would like to thank you for the way you handled the case,especially for taking it on at such short notice and also for your kindness. Your calm and professional manner was a huge help on what was a stressful and emotional day. Ms C W from Taunton. From our first meeting in Taunton Family Court, Emma did everything she could to help guide us through this interesting but stressful time. Mrs HN from Bath and North Somerset. I received fantastic supportive service. Emma was very thorough and helped me every step of the way through a very tough time. Ms CS from West Somerset. Thank you so much for your sound advice and hard work. I am really looking forward to the summer hols and the extra time I have with my son and working hard to achieve our re-unification. I will keep you informed of developments. Thanks again. Mr PP from Bridgwater. Daisy has specialised in Family law since 2005 and qualified as a Chartered Legal Executive in 2012. Daisy then went on to qualify as a Solicitor in 2017. Daisy has worked in private practice throughout her legal career and worked in the local office of a regional firm for 10 years prior to joining the team here at KSFLP in 2015. Daisy is a member of the Junior Lawyers Division of the Devon & Somerset Law Society. Daisy deals with every aspect of Family Law including divorce proceedings and financial resolution as well as all aspects of Public and Private Law Children Act matters. She also acts for victims of domestic abuse, offering support to victims of any age or gender. She is a member of the Taunton Domestic Abuse Forum. Daisy particularly specialises in children cases and frequently advises and represents clients in respect of Child Arrangement Orders, Specific Issue Orders and Prohibited Steps Orders dealing with matters concerning a child’s living arrangements, the amount of time a child should spend with the absent parent post separation and issues concerning relocation and the restriction of parental responsibility. In addition, Daisy frequently represents clients in Public Law Care Proceedings to include parents, grandparents and other extended family members, providing advice and representation to clients in respect of Care proceedings, Special Guardianship and Adoption. Daisy has been involved in a number of complex cases involving parents with learning difficulties, medical issues including non-accidental injury to children and child sexual abuse, both real and fabricated. Excellent (the very best). Mrs and Mrs C from Wiltshire. Very approachable, kept me up to date – very good Mr W from Wiveliscombe. Gave advice in a way that was easy to understand and was very good. Mr N from Bridgwater. Brilliant/very happy. Mr P from Taunton. Carole qualified as a Chartered Legal Executive in 1994, prior to that she worked as a secretary and legal clerk for a number of years. Carole has specialised in Family Law since qualifying. She is a Resolution accredited specialist in Children Law (private), Cohabitation and Domestic Abuse. Carole has worked in private practice in law firms in different areas of the country. She was also employed for 5 years by Plymouth City Council in their Legal Department providing advice to Social Workers; acting on behalf of the Local Authority in Public Law Children Act court proceedings; advising at Child Protection meetings and adoption and fostering panels. Carole returned to private practice in 2003 when she moved to Taunton, where she now undertakes all aspects of family work, including Public and Private Law Children cases; divorce/civil partnership difficulties and financial matters; cohabitation agreements/ separation agreements. She also acts for victims of domestic abuse, offering support to victims of any age or gender. Carole is a member of the Taunton Domestic Abuse Forum. She receives referrals from Woman's Aid both locally and out of area; Mankind which is a charity supporting male victims of domestic abuse. Carole Newstead is a very nice lady. Very warm, helpful and easy to talk to . Just to say thank you, for all your hard work sorting my divorce. I must tell you that the house feels so much nicer now. I can put the fun and laughter back into the place! I am very pleased that I chose KSFLP. Reception staff are very nice too. Mrs BG from Taunton. Very good - I would recommend the KSFLP practice very highly. Thank you for all your help in what has been a very difficult period in my life. Your professional approach and how you have made things easy for me to understand has been a great comfort to me. Thanks again. Mr PP from Bridgwater. Thank you so much for all that you have done for me over the years in seeing my divorce through. I have appreciated your help and support so much. With very grateful thanks and very best wishes. Ms AJ from Taunton. Carole was fantastic. Very thorough, friendly, knowledgeable and great at communication. Thank you Carole. All the best for the future. If we need you, we will definitely use your services again. Ms V of Wellington. Carole was very good, informative and professional. Mr P from Taunton. I was very, very happy with the service I received and I couldn’t have had any better. Carole was very respectful of me particularly because of my mental health issues and my mind was always put at ease. Ms P of Taunton. Very efficient and organised. Very Friendly. Ms J from taunton. Sarah is a Chartered Legal Executive. Sarah deals with divorce and the dissolution of civil partnerships as well as all aspects of financial resolution and private children law cases. Sarah is a member of the Junior Lawyers Division of the Devon and Somerset Law Society and a member of Resolution (First for Family Law). Excellent. Sarah was very friendly and approachable from the very first meeting putting me at my ease. She gave sound advice and acted promptly. I would highly recommend the firm. Miss C B from Taunton. Very helpful, always willing to talk. Service was brilliant. I would like to say a big thank you for helping me. Mrs C T from Taunton. Helpful and prompt. Many thanks for your help, Sarah. John from Taunton. Amazing. From start to now, Sarah has been amazing. I couldn't have done this without her. The whole process(made difficult by the other party) was made bearable by Sarah & Co. Mrs L W from Taunton. Sarah has been very helpful and helped me remain focused in this unpleasant process. Thank you so much for your professionalism and prompt response to me. I would personally recommend Sarah to someone in my position. Mrs P W from Taunton. Supportive, Professional, Transparent and Honest. Mr AB from Somerset. Very professional and sympathetic. Ms AM from Taunton. Thanks for your kindness and support. Mr FG from Bridgwater. Excellent – very professional and supportive. Great with everything. Thank you for very professional approach and for all of your support this year. Mr N of Taunton.